Arsenal playmaker Mesut Ozil is out of today’s game against Tottenham, with the official line seeming to be that he has a back injury. One well-connected blogger, however, claims to have heard that the German midfielder refused to train ahead of the game as he’d heard he wouldn’t be starting anyway. If true, this is a big worry for the Gunners, with Ozil one of the best and most important players for a number of years. Still, some fans may also see some positives from this, with manager Unai Emery not ready to be bullied by big names. The Spanish tactician looks more of a strict disciplinarian than his predecessor Arsene Wenger, and to be fair on him, it seems to have served him well in his career. 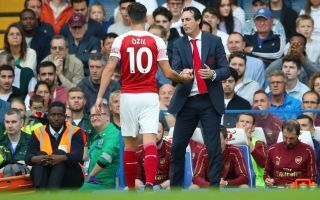 Emery will take charge of his first North London Derby this afternoon as Tottenham come to the Emirates Stadium, and he’ll have to find three points without the help of Ozil. Arsenal also appear to be lining up in the same 3-4-3 formation as the one that got them a win at Bournemouth last weekend.